Yes, Clefford. 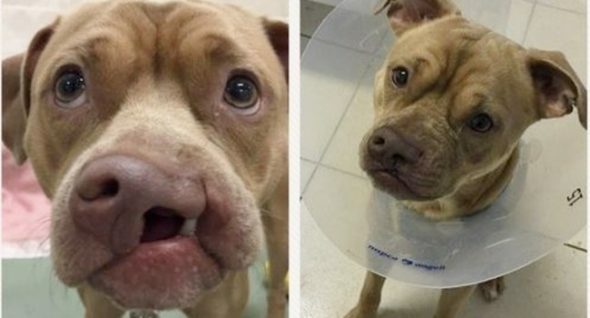 With an E.
Reddit user Will Stoltenberg posted a before/after pic of his new rescue puppy, a pit bull mix who was recovering from a surgery that fixed his cleft palate. The procedure was done at the Angell Animal Medical Center in Boston. 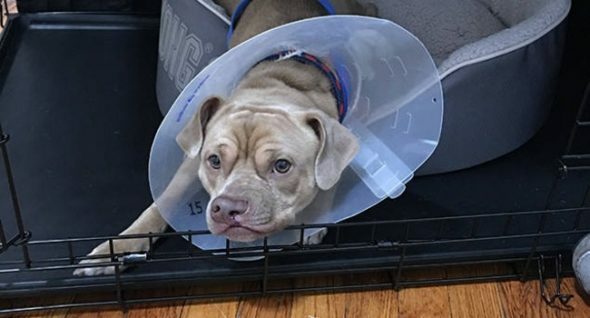 Healing, and looking sullenly handsome in his cone of shame, Clefford still has one more surgery ahead of him, but despite the convalescence he is enjoying the new digs of his forever home with Stoltenberg. His new dad has some great plans for Clefford, too. He hopes to have him certified as a service dog. Handsome Harold: Easygoing Irma Refugee Needs A Home! Thank you for taking this special guy into your home.